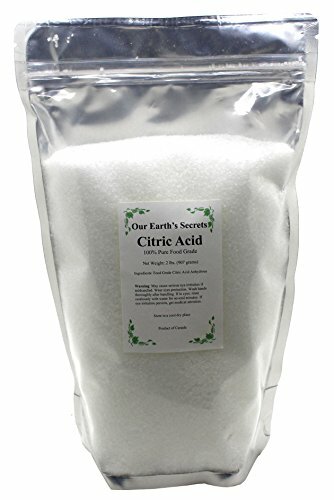 Adds an acidic or sour taste to meat, candy, soft drinks, and ice cream. It keeps fruits and vegetables fresh and food flavorful. Perfect for use for in craft making, candy making, pH adjustment, water softening, and more. Helps in sprouting, canning, drying or freezing, bread making, conserving, and jarring. Can also be used as a natural cleaning agent. Great for Bath Bombs (fizzies) & Kettle Descaler. Non-GMO, Meet Standards and requirements of the latest edition of the European Pharmacopoeia (Ph. Eur. ), the United States Pharmacopeia (USP), the Food Chemical Codex (FCC), and of Commission Regulation (EU) No. 231/2012. 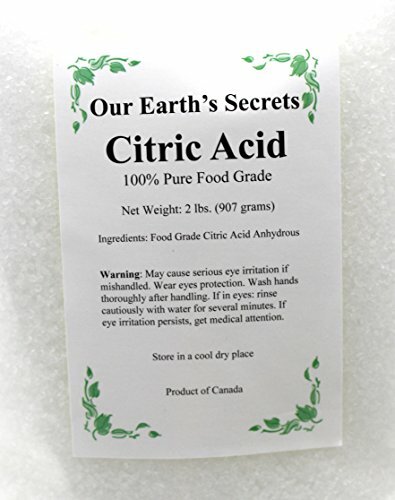 Details: Our anhydrous citric acid is 99.9 % Pure, Non-Gmo, Food-Grade, Crystals from Canada, and Packed in the USA. It is the highest quality available, comes in a safe food-grade resealable bag and can be used in a wide range of applications. It is a must have item- its properties will help you when adding flavor to your foods and beverages, or in cleaning. – Used in insecticides, fungicides, and disinfectants. Making it excellent for all household cleaning needs. – Removes lime, scale and hard water build up.